Published by Hay House, 2017. In many cultures prayer or meditation is enhanced using prayer beads such as the 108-bead mala in the Buddhist tradition. 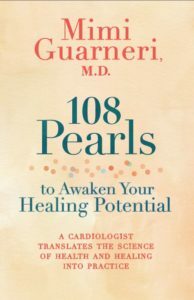 In this book, Dr. Mimi Guarneri, internationally-renowned cardiologist, scholar, author and leading proponent of integrative medicine, blends modern science and ancient wisdom to offer her own guide of 108 pearls–steps you can take to awaken your healing potential; body, mind and spirit. As you explore the science of health, healing and longevity, Dr. Guarneri translates this science into practical solutions to lead you to physical, emotional, mental and spiritual well-being. With the guidance of her 108 pearls in this book, you will understand why your genes do not determine your destiny; how to adopt a diet for resilience; how to turn stress into strength; how to achieve holistic mental health; how to nourish your relationships; how to tap into the healing power of your thoughts; how to strengthen your spirituality and heal your energy body. You will learn how to naturally heal common health challenges like heart disease, diabetes, depression, anxiety and high blood pressure. Most importantly, you will use what you’ve learned to help heal our planet. Once you realize that health is the result of an intimate dance between ourselves and our world, you’ll move from just surviving to thriving! markable interventional and surgical procedures, over 650,000 new heart attacks occur annually. In The Heart Speaks, Dr. Guarneri reveals groundbreaking new research that the heart is a multilayered, complex organ, possessing intelligence, memory, and decision-making abilities independent from the mind — and that healing the heart can have more to do with healing the mind and soul than we ever knew. From childhood in a family riddled with heart disease to a medical career facing the pounding heartbeats of cardiac emergencies, Dr. Guarneri draws us into the intimate moments of life and death, and leads us on a riveting exploration of the heart’s many mysteries. Through her compelling memoir we see that it is only by knowing the whole heart — its mental, emotional, spiritual, and universal aspects — that we can truly heal. Dr. Guarneri takes the reader on a journey of the heart – exploring the emotional heart, able to be crushed by loss; the intelligent heart, with a nervous system all its own; and the spiritual heart, which yearns for a higher purpose. She skillfully weaves the science and drama of the heart’s unfolding. With groundbreaking new research and unparalleled experience, Dr. Guarneri explores the new science that indicates the heart acts as a powerhouse that makes its own decisions. Her book includes a poignant collection of stories from heart patients who have benefited from integrative medicine approaches. The Heart Speaks and her clinical work have been featured on NBC Today and PBS’s To the Contrary and Full Focus. Her work was also featured in a two-part PBS documentary,The New Medicine. Dr. Guarneri is regularly quoted in national publications such as the Yoga Journal, Body+Soul, Trustee Magazine, MindBodyGreen.com and WebMD. 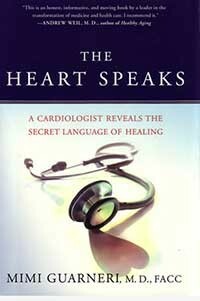 You may call us directly at 858-459-6919 to order The Heart Speaks: A Cardiologist Reveals the Secret Language of Healing. 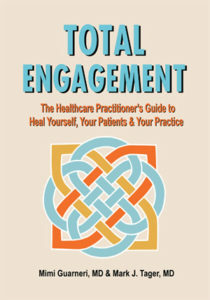 We are happy to ship Dr. Guarneri’s book out to you from Pacific Pearl La Jolla. It is $15.99 plus tax and shipping. We usually send by USPS mail but we can customize your delivery. No matter what your profession in healthcare—whether you are a medical physician, a naturopathic doctor or chiropractor, a nurse, NP, PA or a complementary or mental health professional—Drs. Mimi Guarneri and Mark Tager will guide you on a path to greater personal and professional satisfaction. For the burned out or frustrated clinician, Total Engagement will help you kindle the spirit and the inherent joys of practice in which passion is in great evidence, time flies and meaning and purpose prevail. For the practitioner who wants to augment income or restructure their practice—perhaps with a membership or private pay component, you’ll find practical suggestions and helpful hints from clinicians who have done so. In part one: Heal Yourself, you will begin examining your attitudes, beliefs, values and behaviors to determine whether they are moving you in positive or negative directions. You will learn a host of techniques that can help you become more resilient. If you are wondering whether you should stay in your current practice structure, or make a change, TE will help you examine the five types of courage that can help you succeed. In Part 2, Heal Your Patients, you will become acquainted with a new model of Integrative Medicine beginning with the art and science of patient engagement. You will learn ways to incorporate lifestyle, functional medicine and holistic techniques into your practice. And, you’ll gain an understanding of the evidence behind each of the various modalities. In Part 3 Heal Your Practice, you will learn how to attract the types of patients you want to treat and gain the tools that can allow you to do so. You will find myriad ways to augment your practice with new products and services. These practice additions allow you to serve larger audiences and to generate additional income. You will also learn how to effectively promote and lead your practice, and if you are so inclined, to ply your skills in non-clinical activities. Total Engagement is available only in a limited release. It is NOT available on Amazon, nor is it available electronically. You may call us directly at 858-459-6919 to order Total Engagement. We are happy to send this book out to you from Pacific Pearl La Jolla. It is $34.95 plus tax and shipping. We usually send by USPS mail but we can customize your delivery.